Radiative cooling is the natural process through which objects shed heat in the form of infrared (IR) radiation. All materials at room temperature emit infrared at wavelengths of 5–15 μm. However, the process is typically not very efficient because it is counteracted by external influences that heat the object, such as sunlight and air currents. Air, meanwhile, absorbs and emits very little radiation with wavelengths 8–13 μm. The Earth cools itself at night by emitting infrared through this “atmospheric window” into space. After receiving a $3M federal grant from the US Department of Energy’s Advanced Research Projects Agency-Energy (ARPA-E) in 2015, a team at the University of Colorado Boulder (CU-Boulder) in the US developed a new metamaterial film that provides cooling without needing a power input. Made out of glass microspheres, polymer and silver, the material uses passive radiative cooling to dissipate heat from the object it covers. It emits the energy as infrared radiation and also reflects solar light. Most importantly, the material can be scalably manufactured at low-cost through roll-to-roll manufacturing processes. Passive cooling technology dissipate heat from Earth into outer space (3 K) as infrared radiation through the atmospheric transparency window (8–13 μm). A hybrid glass microsphere-plastic metamaterial film that is fully transparent to the solar spectrum while having an infrared emissivity greater than 0.93 across the atmospheric window has been developed. 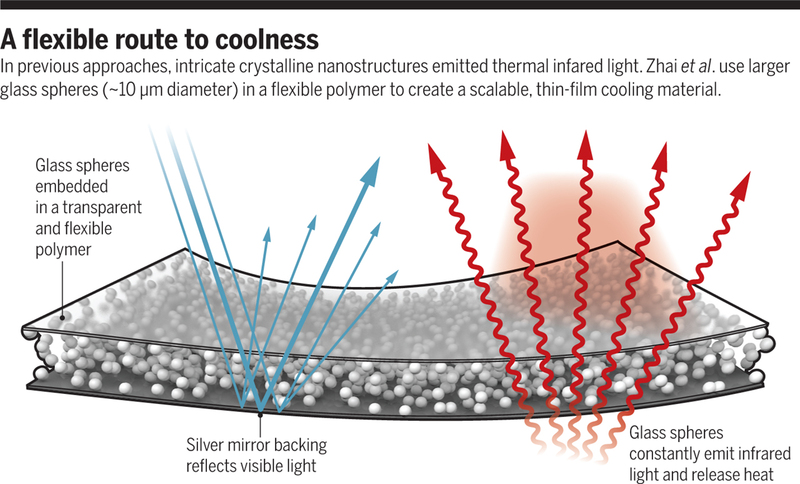 When backed with a silver coating, the metamaterial film shows an average cooling power > 110 over three continuous days and a noon-time cooling power of 93 between 11am – 2pm. It cools objects underneath the radiative cooling film to 10 K and 16 K below ambient during day-time and night-time, respectively. Low cost due to the high throughput, economical roll-to-roll manufacturing. When integrated with silicon photovoltaic cells, it increases its efficiency by 5% (absolute efficiency gain of 0.5-1% due to more than 10 K cooling) and increases its lifetime. Developing a cooling system with 40 square meter radiative cooling surface would be sufficient to cool a common US residential home, with no power input. 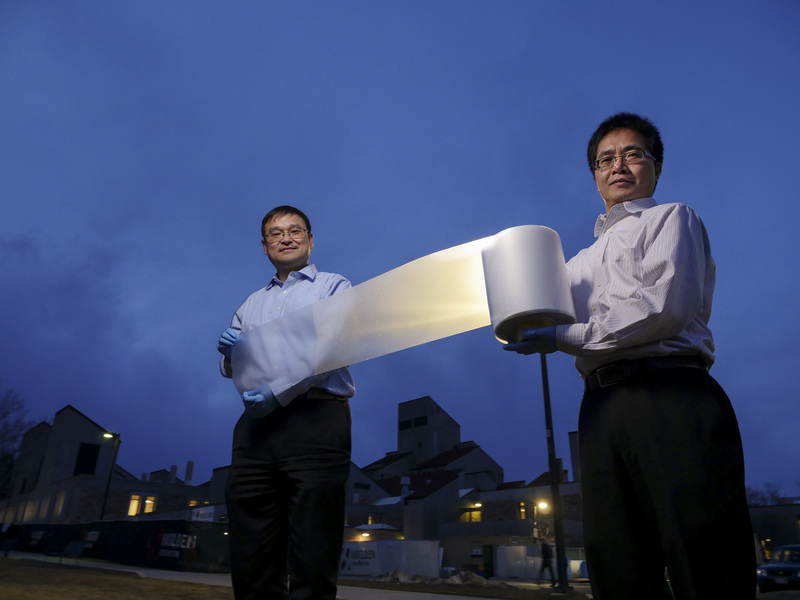 Applying the film directly on the roof could save air conditioner energy use by more than 30%. Radiative cooling could be an enabling technology for energy savings in agriculture greenhouse and transportation sectors. Low-cost radiative cooling can be developed to be a supplementary cooling technology for thermoelectric power plants with no water use.